Updated: We've updated our impressions of GoPro's Karma drone and gimbal system with a new accessory that lets you mount the gimbal almost anywhere. The Karma Drone has been GoPro’s soap opera. It’s been a rollercoaster of excitement and disappointment, all of which started with vague sightings and rumors leading up its grand arrival – and the long-awaited drone was then recalled a few months later, when a fatal battery flaw began causing drones to lose power mid-flight and fall from the sky. GoPro has now addressed the Karma Drone’s battery woes and put it back on sale. But, the question is, has the world of drones moved on in its absence, and is there still room for the Karma? 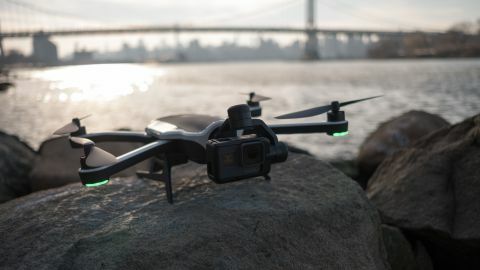 Drones aren't cheap, but the GoPro Karma comes in at a surprisingly reasonable $1,099 (£999, AU$1,649) price considering everything that's included in the package. That price puts it just slightly above the $999 (£1,099, AU$1,699) DJI Mavic Pro and $799 (£829, AU$1,899) Yuneec Q500 4K Typhoon; but, as the line goes, the Karma is so much more than a drone. The GoPro package offers more versatility, with a removable GoPro Hero5 camera that you can use separately or attach to a handheld gimbal. There are also plenty of barebones options to purchase only what you need. The Karma Drone is especially tantalizing for GoPro Hero 5 owners, as the rest of the package costs $799 (£719, AU$1,195) without the bundled camera. There are even more slimmed-down options. There’s a drone-only kit for $599 (about £470, AU$790), while $399 (about £320, AU$530) nets you just the quadcopter without a gimbal or even the included controller. Users can also purchase the Karma Grip on its own for $299 (£289, AU$499), while for those who are curious the GoPro Hero 5 costs $399 (£399, AU$549). At the time of writing, GoPro has only announced that the Karma Drone is back on sale in the US. However, we expect availability at its original pricing (as we’ve listed) should be returning to other territories including the UK and Australia. The Karma Drone led the charge for compact quads when it debuted last September. Measuring 14.4 x 8.8 x 3.5 inches (36.5 x 22.4 x 9cm) when all folded up, it's dramatically smaller than the DJI Phantoms that have dominated the consumer airspace for years. However, this is exactly where DJI came in to steal the Karma’s thunder with the water bottle-sized Mavic Pro, which was announced a week after GoPro’s quad. Despite it not being the smallest drone in the world, the way you can stash the Karma into a regular backpack is admirable. This is all thanks to a folding design that sees the both sets of arms flipping forward, while the landing gear closes flat against the drone’s underside. The Karma Drone is also unique in that the camera sits on its nose, whereas most quads have the camera hanging underneath their fuselages. Seating the camera up front enables a greater range of upward movement. Another benefit is that the rotors and the drone’s chassis are rarely captured on video. Unlike other drones, the camera and even the stabilizing gimbal aren’t permanently attached to the Karma Drone. You can pull out both the camera and gimbal after giving the front collar lock a quick twist, and attach it to the included Karma Grip for stabilized handheld video. Alternatively, the camera is held in place by a simple clamp that you push to open. Once it's removed you’ll have a standard GoPro Hero 5 camera that you can use for your earthbound action shots. Last but not least, the included controller also makes the Karma Drone stand out. It comes with an integrated 5-inch touchscreen, along with all the usual flight controls, and folds up into a portable package just like the drone itself. Although the Karma Drone's main body is made primarily of a lightweight plastic, it feels tougher and sturdier than most quads. During our month with the drone, it survived several scuffs along the ground and hard landings unscathed. In the event of a real crash, it’s easy enough to replace parts. You can take out the metal limbs with a single screwdriver; meanwhile, the gimbal assembly also makes replacing the camera and its stabilizer a simple process. Unfortunately, the Karma Drone isn’t as sturdy when it’s in the air. Without any ultrasonic sensors or external cameras, it doesn’t hover in place as steadily as other drones. You also won’t find any of the intelligent collision-detection or "follow me" features that have almost become standard on quadcopters from DJI and Yuneec. The Karma Drone also only comes with four autonomous modes, including "Orbit" if you want it to fly around you, and "Dronie", which takes a selfie and then zooms way out to show where you are. "Reveal" and "Cable Cam" are the two other modes you can use to send the drone on a set flight path. Even with these special modes, though, you have to manually fly the drone to spots and set the flight path, which rather undermines their autonomy. We also ran into an issue with the camera leveling itself at off-kilter angles and leaving us with a tilted horizon line. Sometimes turning off the drone and finding level ground would fix the issue, but in a few instances we had to drop everything and recalibrate the gimbal. So, the Karma Drone may not be the smartest drone around, but at least it is super simple to fly. It’s quick to respond, and moved predictably by our commands. Although we hadn’t flown a drone for any decent stretch of time before, within a week we felt like we'd become seasoned aviators.